Allee Peck performs solo in David Sedaris’ play, “Season’s Greetings” at The Valiant Theatre. If the dictionary definition of valiant is “showing courage and determination,” then Richard Mayer is proving what it takes to bring live, independent theater not only across the canal, but also across the railroad tracks. Manager of the new Valiant Theatre and Lounge on St. Claude Avenue in Arabi, Mayer ran the Old Marquer/Shadowbox Theatre in Marigny for several years. Formerly a pawn shop, The Valiant is an enhancement of the Old Arabi Cultural Arts District, which is being developed along St. Claude Avenue with help from the Meraux Foundation. The 120-seat theatre will feature live theater Thursday through Friday, presented by different production companies, as well as burlesque, comedy and performance art. Accompanying the theater space is a cocktail lounge open daily that features live piano music. Other productions so far include The Nightmare Before Christmas Burlesque, Get A Way Closer: 5 characters with plenty (and nothing) to say, and the classic Little Shop of Horrors. On the night I checked it out, Rockfire Theatre was staging two monologues written by David Sedaris, who rose to fame in 1992 when National Public Radio broadcast his essay, “SantaLand Diaries.” Sedaris has since written a series of diabolical Christmas stories. Two monologues, “Season’s Greetings” and “The SantaLand Diaries” are often performed together. The Valiant stage was set for Christmas with life-size toy soldiers and a hearth decorated with Christmas stockings. In “Seasons Greetings,” Allee Peck plays a fiendish mother of a dysfunctional family, determined to ensure the “perfect” family Christmas, no matter the cost. 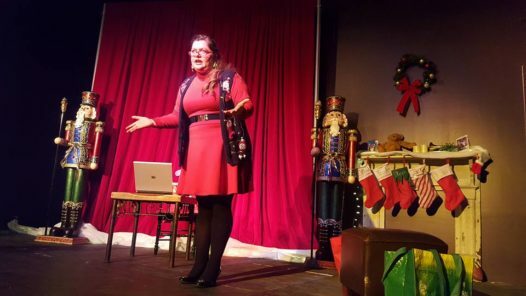 Dressed in a hideous Christmas sweater, she alternates between typing on the computer and making her case to the audience for her aberrant behavior. Peck expertly reels in the audience while unraveling her horrifying holiday secret. August Strindberg, the acerbic, Swedish playwright, could not have told a more devastating domestic tale. 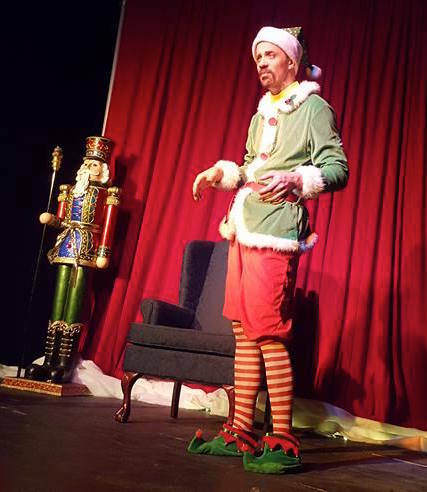 Matt Reed plays a department store elf in SantaLand Diaries. In the companion Sedaris piece, the gangly and bearded Matt Reed plays the unlikely role of Macy’s seasonal worker, demonstrating that being a 33-year-old photo elf is much more complicated than it seems – pacifying crying children, negotiating with harried parents, following bizarre department store regulations and staying merry for eight hours straight. Kids don’t have time to tell Santa about their wish list because they are being art directed for the holiday photo. Keep an eye out for more fringe theater at The Valiant, just a couple of miles beyond Bywater with plenty of parking and craft cocktails at 6621 St. Claude Ave. And find it on Facebook.